2. Why Consider a Road Diet? For roads with appropriate traffic volumes, there is strong research support for achieving safety benefits through converting four-lane undivided roads to three-lane cross sections with TWLTLs. Operational and design changes associated with Road Diets that promote safety include reduced vehicle speeds, reduced vehicle-pedestrian, -bicycle, and -vehicle conflicts. For detailed information about the research behind the safety impacts of Road Diets, see Appendix A. Road Diets improve safety by reducing the speed differential. On a four-lane undivided road, vehicle speeds can vary between travel lanes, and drivers frequently slow or change lanes due to slower or stopped vehicles (e.g., vehicles stopped in the left lane waiting to turn left). Drivers may also weave in and out of the traffic lanes at high speeds. In contrast, on three-lane roads with TWLTLs the vehicle speed differential is limited by the speed of the lead vehicle in the through lane, and through vehicles are separated from left-turning vehicles. Thus, Road Diets can reduce the vehicle speed differential and vehicle interactions, which can reduce the number and severity of vehicle-to-vehicle crashes. Reducing operating speed decreases crash severity when crashes do occur. 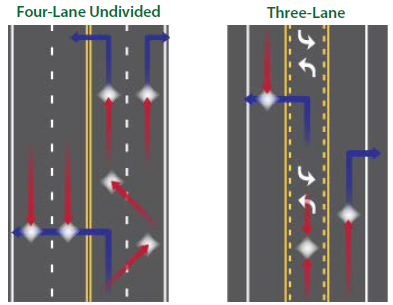 The figures below illustrate conflict points and safety issues related to turning movements for four-lane undivided roadways and three-lane cross sections. In one case in Grand Rapids, Michigan, the transit agency moved a bus route that had become too slow and unpredictable after a Road Diet. Separating Left Turns. 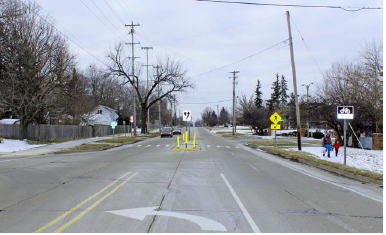 Separating left-turning traffic has been shown to reduce delays at signalized intersections. Side-street Traffic Crossing. Side-street traffic can more comfortably enter the mainline roadway because there are fewer lanes to cross. This can reduce side-street delay. Speed Differential Reductions. The reduction of speed differential due to a Road Diet provides more consistent traffic flow and less "accordion-style" slow-and-go operations along the corridor. On some corridors the number and spacing of driveways and intersections leads to a high number of turning movements. In these cases, four-lane undivided roads can operate as de facto three-lane roadways. The majority of the through traffic uses the outside lanes due to the high number of left-turning traffic in the inside shared through and left-turn lane. In these cases a conversion to a three-lane cross section may not have much effect on operations. Road Diets can be of particular benefit to nonmotorized road users. They reallocate space from travel lanes– space that is often converted to bike lanes or in some cases sidewalks, where these facilities were lacking previously. These new facilities have a tremendous impact on the mobility and safety of bicyclists and pedestrians as they fill in a gap in the existing network. Even the most basic Road Diet has benefits for pedestrians and bicyclists, regardless of whether specific facilities are provided for these modes. As mentioned above, the speed reductions that are associated with Road Diets lead to fewer and less severe crashes. The three-lane cross-section also makes crossing the roadway easier for pedestrians, as they have one fewer travel lanes to cross and are exposed to moving traffic for a shorter period of time. Road Diets often include either onâ€“street parking or a bike lane, which create a buffer between pedestrians and moving vehicles. This is especially beneficial in central business districts if officials desire to improve the pedestrian experience. For bicyclists, the biggest benefit of Road Diets is through the addition of bicycle facilities. A Road Diet can transform a street that was formerly difficult for a bicyclist to travel along to a comfortable route that attracts many more bicyclists. When bicycle lanes are striped, bicyclists are more visible and motorists know where to look for them, speeds are reduced, and bicycle safety can be improved. In some cases, buffered bicycle lanes are added by providing a visual or even physical barrier between modes of travel (e.g., adding flexible delineators on the lane line between motor vehicles and bicycles.) This further enhances the comfort of the route and may encourage increased usage. 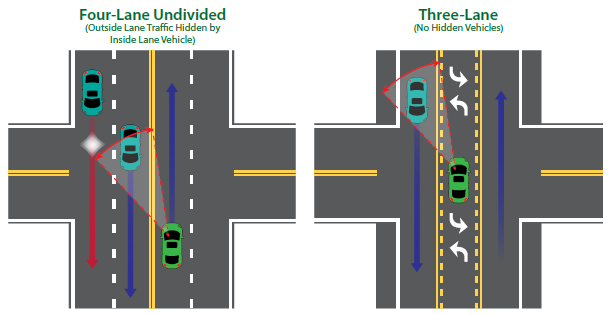 Even without a dedicated bicycle lane or buffer, a motorist on a three-lane roadway is able to move over closer to the center lane on a three-lane roadway when approaching a bicycle. A motorist on a four-lane undivided roadway will have less opportunity to move over to the left as it is an active travel lane. Added to the direct safety benefits, a Road Diet can improve the quality of life in the corridor through a combination of bicycle lanes, pedestrian improvements, and reduced speed differential, which can improve the comfort level for all users. Livability is, "about tying the quality and location of transportation facilities to broader opportunities such as access to good jobs, affordable housing, quality schools, and safer streets and roads. 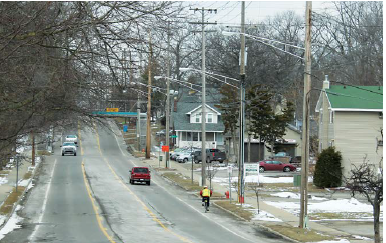 "17 Road Diets can help achieve desired livability on certain roadways. Interviews with agencies that have implemented Road Diets found many synergies between improvements for one mode and their impacts on another. 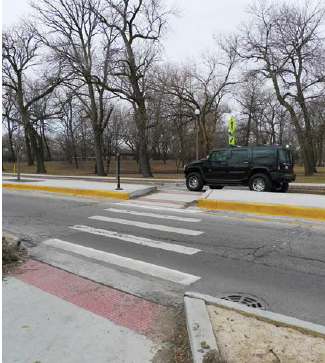 The City of Chicago found that the addition of pedestrian refuge islands, as illustrated in Figure 9, was a significant benefit of their Road Diets. In some cases, improving pedestrian safety was the main objective of the Road Diet, but in other cases, the original intent was to add bicycle lanes or to simply address general traffic safety and/or operations issues. Table 2 summarizes the positive and negative potential impacts of various features of Road Diets based on findings from researcher field visits and agency interviews. Some of the treatments for one mode have obvious synergies with other modes, such as bicycle lanes that not only provide added comfort for bicyclists, but also for pedestrians by increasing their separation from vehicles. Other relationships are not as obvious. For instance, Road Diets in Iowa and Chicago generated increased vehicular traffic on the corridor, indicating an increase in demand after installation. In Pasadena, the unexpected benefit of a Road Diet to a pedestrian crossing (the pedestrians were able to safely cross more easily) eliminated the need for a pedestrian traffic signal, resulting in cost savings and the potential impacts of the traffic signal on traffic flow. In some jurisdiction, maintenance funding is tied to the number of lane-miles, so reducing the number of lanes can have a negative impact on maintenance budgets. Similarly, some Federal funds may be reduced. Barrier can prevent users entering a lane reserved for another mode. Grass and delineator buffers will necessitate ongoing maintenance. The impacts on transit varied among the Road Diets studied. In some cases, the Road Diet was seen as a positive by the transit agency. In other cases, particularly in less urban areas, the reduction of travel lanes caused congestion as traffic backed up behind buses loading and unloading at the curb. A similar consequence as a result of mail delivery was also found in less urban areas. Prior to the Road Diet, vehicles were able to pass stopped buses or mail carrier vehicles using the inside lane. The back-ups that occurred after the conversion resulted in some vehicles making illegal maneuvers to pass the bus in the two-way left turn lane (TWLTL). Some Road Diets include measures to address this issue, such as shoulders or dedicated pull-outs that allow buses and mail trucks to make their stops outside the travel lane. Road Diets can also introduce some traffic safety concerns. One concern is the use by pedestrians of TWLTLs as a refuge, which could make pedestrians vulnerable to being struck by vehicles traveling in the TWLTL. However, as evidenced in published assessments of Road Diet implementations, pedestrian safety is generally enhanced by this type of roadway reconfiguration, especially if a pedestrian refuge island is included. A Road Diet on Ingersoll Avenue in Des Moines, IA provided a benefit to buses: instead of stopping in a through lane and blocking traffic as they had done before the reconfiguration, the new design accommodated transit buses with a bus turn out. Some impacts are seen as a positive by some agencies and a negative by others, which may be dependent on the context and users of the roadway. In Iowa, a Road Diet along a truck route narrowed lanes from 13 feet to 10 feet; these seemed too narrow to commercial vehicle drivers. Meanwhile, in Chicago and Michigan, shoulders and buffers between bicycle lanes and travel lanes were added primarily to keep travel lanes to 12 feet wide or less. In these cases, the wider lanes were undesirable because they encourage faster speeds. In addition, a common concern in implementing Road Diets is that drivers on cross-streets or driveways may have difficulty finding a suitable gap in traffic to enter the main roadway because through traffic is now using a single through lane. However, in Chicago it was found that some side street traffic had an easier time crossing the corridor after the Road Diet was installed because the traffic patterns were simpler and gaps were easier to find. In some States maintenance funding can be affected. Lane-miles are sometimes used as the measurement to calculate budgets for maintenance activities, defined only as those miles used for motor vehicle traffic – not bicycle lanes, parking, or other uses. When a Road Diet is introduced, one-quarter of the motor vehicle lane-miles are removed, which can equate to a similar reduction in maintenance funds. Discussions are underway in affected states to address this situation.